Has Russia reached the limit of its diplomatic tolerance of the US and its NATO allies? The announcement this week that Moscow is to begin deploying long-range bombers in the Gulf of Mexico - America's own backyard - suggests so. Even Washington officials have begrudgingly acknowledged Russia's legal right to do so. The Christian Science Monitor quoted Pentagon spokesman Col. Steve Warren as saying, "Russia has a right to fly in international airspace". However, we can be sure that the hawks in Washington will be fuming at what they see as Vladimir Putin's "audacity" to order warplanes within striking distance of the US. For the de facto American War Party of Republicans and Democrats, the latest Russian move confirms their accusations that President Putin is trying to flex "Soviet-era muscles". Or, as American NATO commander General Philip Breedlove put it, Russia "is messaging us that they are a great power". That's typical arrogant mis-reading by Washington of the situation. This is not Putin trying to be provocative or flaunting expansionist ambitions. It is simply Russia giving a taste of American medicine back and in language that the arrogant warmongers in Washington will understand. The destabilization earlier this year of former Soviet republic Ukraine to install an illegal, anti-Russian regime that is massacring the ethnic Russian population in the east of that country - in spite of a putative ceasefire - is seen by Moscow as a red line. That offensive followed days after CIA director John Brennan secretly visited Kiev and had behind-closed-door meetings with the regime's leadership, including the so-called Prime Minister Arseniy Yatsenyuk. Yatsenyuk has referred to the Russian-speaking population in the eastern regions as "sub-humans" who need to be "cleansed". After nearly seven months of Western-backed state terrorism by Kiev forces, more than 4,000 people have been killed and up to one million turned into refugees. This week, Russian foreign ministry spokesman Alexander Lukashevich again reiterated Moscow's denial that it has sent troops or military equipment into eastern Ukraine. 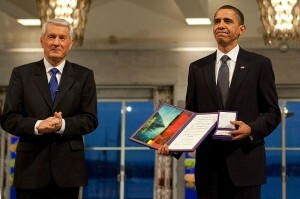 He said of the latest NATO claims: "Instead of giving the facts, all they have to present is unfounded accusations. It would be far better to ask the [Western] officials who make such statements in order to fan tensions and justify their actions." Russian ministry of defence spokesman Igor Konashenkov was even more blunt. He said: "We have already stopped paying attention to unfounded statements by NATO's Supreme Allied Commander in Europe General Philip Breedlove about his 'seeing' Russian military columns that are allegedly invading Ukraine." It seems as if Moscow has finally got tired of dealing with idiotic Americans and their European puppets through normal diplomatic discourse. Putin may have met Obama briefly at the Asia-Pacific Economic Cooperation summit last week and during the G20 gathering this weekend in Australia, but it has been reported that the Russian leader no longer takes phone calls from his counterpart in the White House - much to Obama's chagrin. Put it another way, to keep pandering with futile diplomacy and to not reciprocate the show of force with Washington and its minions would be the really reckless option. You don't encourage a bully. Instead, you have to square up and push back. Ottawa - Today the Government of Canada released its revised Corporate Social Responsibility (CSR) Strategy for extractive companies operating overseas, finally recognising its power to withdraw the substantial support that it provides such companies in order to make them accountable, but declining to apply that power in any meaningful way. While a more substantive review of the updated strategy will depend on specifics that have yet to be released, for example regarding the CSR Counsellor’s mandate, a few things jump out. The Government of Canada still says that it “expects” Canadian companies operating overseas to respect human rights, all applicable laws and recognized international standards for responsible business practices, as well as “Canadian values.” But it notes that if this is not possible, “companies may wish to reconsider their investment.” This is important guidance for Canadian companies operating in places such as Eritrea or Tibet where it is flatly impossible for them to meet these requirements. The revised CSR Strategy claims to make these services contingent on Canadian companies demonstrating their alignment with the CSR strategy, but the only specific threat is that these services will be withdrawn if companies do not participate “in the dialogue facilitation processes of Canada’s NCP and Office of the Extractive Sector CSR Counsellor.” (The “NCP” is the National Contact Point for the implementation of the OECD Guidelines for Multinational Enterprises.) Both of these institutions have consistently failed to make a meaningful contribution to resolving conflicts instigated by Canadian companies, and merely ensuring that companies at least participate in their processes is unlikely to change this. MiningWatch Canada and the Canadian Network on Corporate Accountability have called for the creation of an extractive sector Ombudsman with the power to respond to complaints by actually conducting an independent investigation of a company’s behaviour overseas and reporting on the findings. The Ombudsman would also have the power to recommend remedy in cases where it has been found that companies have breached established guidelines and caused harm to complainants, as well as recommending that Canadian government financial and political support be withheld. The Government’s revised CSR Strategy does not address the need many complainants have expressed for independent investigations to substantiate the facts of the complaints and report on those findings and potential remedies. Finally, the revised CSR Strategy posits the CSR Counsellor as an initial or “front-end” office for complainants to bring concerns. Complainants would only be referred to the NCP if the Counsellor’s efforts to resolve concerns “have not succeeded or are not appropriate, or if the CSR Counsellor determines that a situation would benefit from formal mediation.” While the NCP’s track record is almost as bad as the Counsellor’s, complainants should in no way be obliged to go through the Counsellor prior to lodging a complaint or seeking mediation through the NCP. The Government of Canada has finally recognised its power to withdraw the substantial support that it provides such companies in order to make them accountable, but declining to apply that power in any meaningful way. Not surprisingly, the president left a lot out of his regional wrap-up. On the subject of proxies, Iraqi troops and small numbers of Syrian rebels have hardly been alone in receiving American military support. Yet few in our world have paid much attention to everything Washington has done to keep the region awash in weaponry. Since mid-year, for example, the State Department and the Pentagon have helped pave the way for the United Arab Emirates (UAE) to buy hundreds of millions of dollars worth of High Mobility Artillery Rocket Systems (HIMARS) launchers and associated equipment and to spend billions more on Mine Resistant Ambush Protected (MRAP) vehicles; for Lebanon to purchase nearly $200 million in Huey helicopters and supporting gear; for Turkey to buy hundreds of millions of dollars of AIM-120C-7 AMRAAM (Air-to-Air) missiles; and for Israel to stock up on half a billion dollars worth of AIM-9X Sidewinder (air-to-air) missiles; not to mention other deals to aid the militaries of Egypt, Kuwait, and Saudi Arabia. For all the news coverage of the Middle East, you rarely see significant journalistic attention given to any of this or to agreements like the almost $70 million contract, signed in September, that will send Hellfire missiles to Iraq, Jordan, Saudi Arabia, and Qatar, or the $48 million Navy deal inked that same month for construction projects in Bahrain and the UAE. By 1949, the Pentagon had established a small, permanent Middle East naval force (MIDEASTFOR) in Bahrain. In the early 1960s, President John F. Kennedy’s administration began the first buildup of naval forces in the Indian Ocean just off the Persian Gulf. Within a decade, the Navy had created the foundations for what would become the first major U.S. base in the region -- on the British-controlled island of Diego Garcia. Bahrain is now the headquarters for the Navy’s entire Middle Eastern operations, including the Fifth Fleet, generally assigned to ensure the free flow of oil and other resources though the Persian Gulf and surrounding waterways. There is always at least one aircraft carrier strike group -- effectively, a massive floating base -- in the Persian Gulf. At the moment, the U.S.S. Carl Vinson is stationed there, a critical launch pad for the air campaign against the Islamic State. Other naval vessels operating in the Gulf and the Red Sea have launched cruise missiles into Iraq and Syria. The Navy even has access to an “afloat forward-staging base” that serves as a “lilypad” base for helicopters and patrol craft in the region. The sad irony is that any legitimate desire to maintain the free flow of regional oil to the global economy could be sustained through other far less expensive and deadly means. Maintaining scores of bases costing billions of dollars a year is unnecessary to protect oil supplies and ensure regional peace -- especially in an era in which the United States gets only around 10% of its net oil and natural gas from the region. In addition to the direct damage our military spending has caused, it has diverted money and attention from developing the kinds of alternative energy sources that could free the United States and the world from a dependence on Middle Eastern oil -- and from the cycle of war that our military bases have fed. David Vine, a TomDispatch regular, is associate professor of anthropology at American University in Washington, D.C. He is the author of Island of Shame: The Secret History of the U.S. Military Base on Diego Garcia. He has written for the New York Times, the Washington Post, the Guardian, and Mother Jones, among other publications. His new book, Base Nation: How U.S. Military Bases Abroad Harm America and the World, will appear in 2015 as part of the American Empire Project (Metropolitan Books). For more of his writing, visit www.davidvine.net. As I was finalizing my research for this article, I found myself browsing through a heap of hilarious videos by mostly Egyptian TV show hosts Tawfiq Okasha and Amr Adeeb. In one of his numerous videos on youtube, Okasha, the star and host of the Cairo-based privately funded al-Faraeen channel, tries to explain the differences between the brains of humans and water buffalos. Along with Adeeb, they occupy a large space of Egyptian media discourse, wreaking so much havoc with their mostly unsubstantiated claims, frequent incite and outrageous claims. Their demagogic discourse presented through daily campaigns of misinformation and vilification of those perceived to be enemies of the state is dangerous, especially when there is little room to counter these claims through critical thinking and sensible discussions. But what is interesting is that neither Okasha, nor Adeeb - and many others like them – were never meant to be entertainers per se, however entertaining they inadvertently may be. In the last year or so in Egypt, much of what has been achieved in terms of carving space for alternative voices in the Egyptian media was quickly and decisively reversed. No matter how hard Bassem Youssef tried to tone down his satirical political message, he failed. His show, Al-Bernameg – The Program – came to an abrupt conclusion last June. “The current atmosphere isn’t fitting for a comedy show or any other show,” Youssef said last June. “The current atmosphere” is damaging the freedom of expression in other Arab societies as well, more so in the last four years when popular upheavals took over several Arab countries, igniting unprecedented regional rivalries. Since then, the polarization of Arab media has reached extreme points. There is little room for opposing views and regimes are fighting an epic battle for survival by using every possible tactic to win, even if by deception, intimidation, or sheer lies. It is not that media in Arab countries has been an example of transparency, equality and democracy - far from it. But, to an extent, there was a media evolution underway, dictated partly by the advent of the Internet and subsequent rise of social media, let alone the heated competition by pan-Arab satellite channels. That evolution, if it were not violently interrupted by a brutal media war should have had some positive contributions. These are the rise of sociopolitical consciousness, affirmation of collective Arab identity, and, more importantly, the creation of a space where the Arab citizen, any citizen, could find room for self-expression free from the confines of government censorship and retribution of the state. But now that the state, desperate to survive burgeoning popular pressures and massive mobilizations, began to appreciate the adverse repercussions from free media platforms, and began cracking down. It seems that the only space that remains open in the state-sanctioned media are those of the likes of Okasha and Adeeb. At this critical stage of popular transformation, the stunting of critical Arab media will register its negative impact for years to come. To save themselves, some Arab regimes have chosen to sacrifice the intellect of their societies. But the issue has its roots in a context that came much earlier than the Arab Spring. In the post-colonial Middle East, Arab countries - especially those who suffered greatly under the reigns of western powers - were eager to knit separate identities for themselves that were neither French, Italian nor English. They sought regional allies among their own brethren, building cultural bridges where Arab radio stations and newspapers served as the medium of political and cultural unity. Of course, that discourse too was manipulated to fit fantastic political ambitions, whether they were genuine – as ones fairly expressive of the will of Arab masses – or fabricated, as self-serving agendas by dictators or ruling classes. The early attempts at pan-Arab media, however, were often used as platforms for regional Arab conflicts. In time, Arab rulers began understanding the immense value of owning and manipulating media to their advantage. And whenever possible, they censored, controlled and punished those who couldn’t be bought or refused to be censored. The Iraqi invasion of Kuwait in 1991, argues Paul Cochrane, was a breaking point between attempts at manipulating and intimidating media, and owning it. The regional breakups that resulted from that war were so severe that they effectively ended the Arab Cooperation Council (ACC), an alliance that united Iraq, Jordan, Egypt and North Yemen. And they further strengthened another: the Gulf Cooperation Council (GCC). The latter had wealth, and that meant media access. The post war brought a buying frenzy, where some rich Arab countries and wealthy businessmen attempted to consolidate their control over Arab public opinion by using newly founded satellite television stations and uniting various Arab societies around cheap entertainment. When Al Jazeera was launched in 1996 and despite the fact that it was funded by a country which itself is not an icon of freedom of expression, a new type of competition rose between rival Arab countries. Other media soon sprang up that were also funded by rich Arabs and manned mostly by Arab intellectuals and journalists from poorer countries. In that new media realm, “freedom of expression” existed as long as they offered views, at least politically, matching the political agendas of the funders. One cannot discount the fact that within that rivalry, independent journalists and intellectuals managed to navigate space for themselves, and by doing so pushed the boundaries of the debate like never before. Then the Arab Spring started. Its decisive collective agenda (regime change) left no room for political bargaining or compromising. It further mixed up regional agendas, creating new alliances, and once more emphasized the power of the media in its ability to harness and sway public opinions. Even pan Arab news networks with a level of credibility, were soon tainted in their rush to influence the public discourse. The media split between geopolitical allegiances as each camp had its own funders and many propaganda arms. Social media is harder to control, for it remains a relatively free space. However, it compels a degree of anonymity to its users, which opens up a whole new challenge in attempting to authenticate information through the endless stream of content and decipher genuine voices from that of government propaganda. Though the media public discourse is severely restricted to some, it is generously open for others such as for those morally flexible intellectuals and media jokers who applauded the Israeli war on Gaza, as the rest of the world protested its devastating carnage. For now, Okasha and Adeeb will continue to take center stage, while thousands of brilliant voices of intellectuals and journalists are muffled and censored. It is hard to imagine that in this age of awakening, such mockery will continue for too long. Ramzy Baroud is a PhD scholar in People's History at the University of Exeter. He is a consultant at Middle East Eye. Baroud is an internationally-syndicated columnist, a media consultant, an author and the founder of PalestineChronicle.com. His latest book is My Father Was a Freedom Fighter: Gaza’s Untold Story (Pluto Press, London). Oil services firm Baker Hughes reported another drop in the active rig count in early November, with oil rigs declining by 14. With 1,568 rigs in operation, the oil rig count is now at its lowest level since August, and down 49 rigs since a peak in October. Rigs could decline to 1,325 in 2015, according to some projections. While some companies appear undaunted, vowing to maintain or even increase production, others are beginning to pare back spending plans. Continental Resources, a major oil producer in North Dakota's Bakken play, has stated that it won't deploy more drilling rigs next year. Pioneer Natural Resources, with large holdings in the Eagle Ford and Permian basin, has hinted at more modest plans for 2015 due to lower oil prices. Transocean's 29 ultra-deepwater drilling rigs had accumulated 296 combined days of being out of service in the third quarter. That was an enormous increase over the previous two quarters - 110 days of out-of-service days in quarter two, and just 98 days in the first quarter. Even worse, the company expects the rigs to be inactive for a total of 435 days in the fourth quarter. Nevertheless, the selloff in oil prices could be overdone. OPEC's Secretary-General Abdullah al-Badri tried to ease concerns, speaking at a conference in Abu Dhabi on November 10. "Please do not panic, things will fix itself," he said. On its face, that response would seem to suggest that OPEC thinks prices have bottomed out. On the other hand, Kuwait's Oil Minister suggested that OPEC will not cut its production target, and echoing al-Badri's comments, he said that "prices will settle down once surplus oil is absorbed. No decision has been made yet, and OPEC will meet at the end of November in Vienna to decide its next move. But merely allowing the market to sort itself out while maintaining current production levels will almost certainly spark a negative reaction in the oil markets. Mad Ozzie Leader Demands Apology from Putin for MH17 Downing, Claims Damning "Evidence"
Russian President Vladimir Putin yesterday held a 15-minute private meeting with Australian Prime Minister Tony Abbott, at which the main issue was the downing of Malaysia Airlines Flight MH17 over eastern Ukraine on July 17. Without any conclusive evidence, Abbott has repeatedly accused Russia of being responsible for the tragedy. The brief discussion, held on the sidelines of the APEC meeting in Beijing, was the first exchange between the two leaders since Abbott last month threatened to “shirtfront” Putin over MH17 at the upcoming G20 Leaders’ Summit in Australia. “Shirtfront” is the term for a particularly violent tackle in Australian Rules football. The official Australian government statement following the Abbott-Putin encounter underscores the highly provocative role being played by the Abbott government for the US in its confrontation with Russia over Ukraine. Within hours of the crash, Abbott began making the unsubstantiated claim that Russia bore responsibility for the deaths of 38 Australian citizens and residents on MH17. Then, according to the statement, Abbott told Putin that Russia should accept responsibility for the crash as the US had done when it “inadvertently shot down” an Iranian airliner in 1988. Washington, Abbott claimed, had “duly apologised and made appropriate restitution” and Russia should follow that precedent. Abbott’s assertions can only be described as outrageous. No credible investigation has been completed into how and why MH17 was brought down. A preliminary report has found that the aircraft was likely destroyed by a high velocity projectile, but who fired it or even what the projectile was, is the subject of heated contention. Theories abound, but none has been substantiated. For Abbott to therefore demand that the Russian Federation apologise—in other words publicly admit guilt for the mass murder of civilians—is, among other things, a staggering breach of diplomatic norms. Najib directed his criticisms to both the Ukrainian government and the Russian-speaking separatists in eastern Ukraine for ignoring calls for a cease fire to allow investigation teams secure access to the crash site. As for Iran Air Flight 655, the circumstances of its downing are completely different from that of MH17. From the day of the incident on July 3, 1988, there was never any doubt that the Iranian aircraft, carrying 290 crew and passengers, was shot down as it flew over the Persian Gulf by missiles fired by the US warship Vincennes. The plane was correctly transmitting codes identifying it as civilian and it was attacked while the American guided-missile cruiser was illegally in Iranian territorial waters. The US government never formally apologised or admitted guilt for the atrocity, and treated the victims, their families and Iran with utter contempt. Its allies in the UN Security Council combined to block any condemnation of the US and instead blamed the disaster on the tensions produced by the Iran-Iraq war. In 1996—eight years after the event—Washington refused in the International Court of Justice to accept legal liability and agreed only to a statement expressing its “deep regret over the loss of lives”. It paid token ex gratia compensation of $61.8 million. Abbott was certainly playing to a domestic audience, seeking to use claims he was “confronting” Russia over the death of Australian civilians to channel social tensions outward and garner support for his deeply unpopular government. At the same time, Abbott’s actions are entirely in line with the confrontational stance being taken against Russia by the Obama administration. During his brief meetings with Putin in Beijing, Obama reportedly issued demands that the Russian government stop supporting Ukrainian separatists as well as the Syrian regime of Bashar al-Assad and the Iranian regime. That Putin agreed to meet with Abbott and listen to his allegations indicates that Russia is on the defensive amid the impact of US- and European-dictated sanctions and diplomatic isolation. The official Kremlin response to the Abbott meeting was low key. It described the encounter as “proper” and stated that Putin had “stressed [that] from the very beginning Russia consistently demanded that the investigation be unbiased, quick and effective”. The Dutch government, which is in charge of the international investigation into MH17, reported on November 11 that forensic teams have been able to return to the crash site in eastern Ukraine. With heavy fighting again flaring in the nearby Donetsk region between Ukrainian government forces and separatists, it is likely they will be quickly withdrawn, further delaying any progress in establishing the cause of the disaster. Buoyed by the Republican electoral victories, America’s neocons hope to collect their share of the winnings by pushing President Barack Obama into escalating conflicts around the world, from a new Cold War with Russia to hot wars in Iraq, Syria, Afghanistan and maybe Iran. The new menu of neocon delights was listed by influential neocon theorist Max Boot in a blog post for Commentary magazine, an important outlet for neocon thinking. Boot argued that the Republicans – and thus the neocons – have earned a mandate on national security policy from the electoral repudiation of Obama’s Democratic Party. Further, Putin’s approach to the Ukraine crisis in February 2014 was reactive, not provocative or expansionistic. It was the European Union and the United States (led by neocons such as Assistant Secretary of State for European Affairs Victoria Nuland, National Endowment for Democracy President Carl Gershman and Sen. John McCain) that set out to overturn the Ukrainian status quo. If Obama had bombed the Syrian military in summer 2013, as Boot and other neocons wanted, not only might Obama have been attacking the wrong people for the sarin attack, he might well have precipitated the collapse of the Syrian government and a victory for either ISIS or al-Qaeda’s Nusra Front, the only two effective fighting forces among the anti-government rebels. There would have been a good chance that jihadist banners would be flying over Damascus, creating a terrorist state in the heart of the Middle East. In other words, Boot is working not only from a false narrative but a dangerous fantasy. Nevertheless, it is a narrative that is widely accepted inside Official Washington where one of the favorite sayings is “perception is reality.” So, although Boot’s perception is factually unhinged, it is regarded as “reality” by many “smart people” in the world’s most powerful capital. After laying out his false diagnosis – that Obama’s supposed failure to destroy the Syrian military in 2013 led to the crises of Ukraine and ISIS in 2014 – Boot then prescribes what needs to be done. Apparently Boot foresees a Libya-style operation in which the U.S. military and its allies destroy a government’s armed forces from the air while rebels on the ground ultimately take power. In 2011, the Libya strategy led to the ouster and murder of Muammar Gaddafi followed by the country collapsing into violence and chaos, including the killing of the U.S. ambassador in Benghazi and the decision by Western governments to abandon their embassies in Tripoli. In Syria, such a scenario would likely lead to a victory by Islamic extremists, but it would fit with the Israeli strategy of favoring the ouster of Assad, an Iranian ally, even if the conflict ended with al-Qaeda-related radicals in power. “We always wanted Bashar Assad to go, we always preferred the bad guys who weren’t backed by Iran to the bad guys who were backed by Iran.” Oren added that this was the case even if the other “bad guys” were affiliated with al-Qaeda. In case you’re wondering, Boot is not just some lonely neocon voice in the wilderness. He is a senior fellow at the powerful Council on Foreign Relations and a close associate of the Kagan family of neocon royalty, which includes Robert Kagan’s wife, Assistant Secretary of State Victoria Nuland. So, the neocon thinking is now out in the open. Boot has explained how the neocons view the national security implications of the Republican electoral victory and how Obama should bend to this supposed mandate. But Boot also has left little doubt what will follow if Obama does submit to the neocon agenda – a future of endless warfare across the Middle East and even nuclear brinksmanship with Russia. There has long been a madness to neocon thinking, matching what the most extreme elements of the Israeli government seem determine to create, a roiling chaos across the Middle East amid fantasies of “regime change” somehow producing Arab leaders compliant with Israeli interests. Yet, to carry out these schemes, which far exceed the capabilities of even Israel’s highly capable military, the American neocons and Israeli hardliners need the U.S. taxpayers’ money to pay for the wars as well as young American soldiers coming from small towns and large cities across the United States to be dispatched halfway around the world to kill and die. Reaction to news that 90-year-old Arnold Abbott was arrested by police in Florida for handing out meals to homeless people in a park. This work, Party of One, should be the political work of the year, and perhaps should stand as the best for this century. It is one of the most powerful books I have read and it should be read by everyone. Anyone entertaining the idea of argument with Harris' solid base of research (through documents and personal interviews) will need to stifle all independent thought and critical analysis abilities. Such however are the very abilities of the Conservative caucus in face of their dear one and only leader, Stephen Harper. 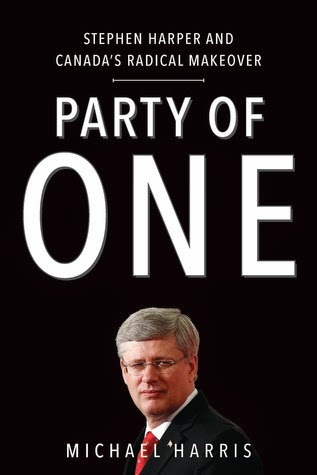 The first two chapters, “Sign of the Times” and “The Genesis of Steve”, provide a concise outline of Harper’s political routes (For more depth on this see also: Harperland - The Politics of Control. Lawrence Martin. Penguin, Toronto, 2011. - itself nominated as Finalist for Best Political Book of the Last 25 Years). The most powerful personage presented here is the Republican Arthur Finkelstein, the “most sought after neoconservative political strategist in the world.” He has worked to unseat opponents with the “strategic use of attack ads” in which “issues don’t matter...perception is reality” and “fear is a political super weapon.” These attributes are supported by the perception that people today are “not wired in, but wired out...knowing more and more about less and less.” Harper has adopted these methods and the truth of the latter statement is unfortunately true for the rather general apathy and ignorance of Canadians. It is unfortunate that the majority of Canadians are apathetic, they want democracy but not necessarily if they have to get out and think and act within it. As Arthur Finkelstein indicated, the Canadian public, through this apathy and ignorance are readily manipulated, “perception is reality...issues don’t matter,” and “fear is a political super weapon.” It works in Canada. And Stephen Harper is taking advantage of it to create a right wing neocon dictatorial militarized state with “one point” control - himself. Party of One - Stephen Harper and Canada’s Radical Makeover. Michael Harris. VIking/Penguin, Toronto, 2014.